Check lights before use and make sure there are no broken bulbs, loose connections, and frayed or cut wires. Do not connect more than three strings of incandescent lights together. Avoid overloading circuits, outlets and extension cords. Protect Cords from damage by using insulated clip hangers to hang lights not nails, staples or tacks. Make sure electrical cords are not underneath rugs, and furniture. Do not use indoor lights outdoors because they are not waterproof. Do not use outdoor lights indoors because they burn hotter than indoor lights. Make sure to water your live tree daily to prevent tree from drying out and causing a fire. Unplug lights when changing bulbs. Outdoor lights and decorations should be plugged into circuits protected by Ground Fault Circuit Interrupters (GFCIs). Check that all decorations you purchase are certified by: Underwriters Laboratories, Intertek, and Canadian Standards Association. 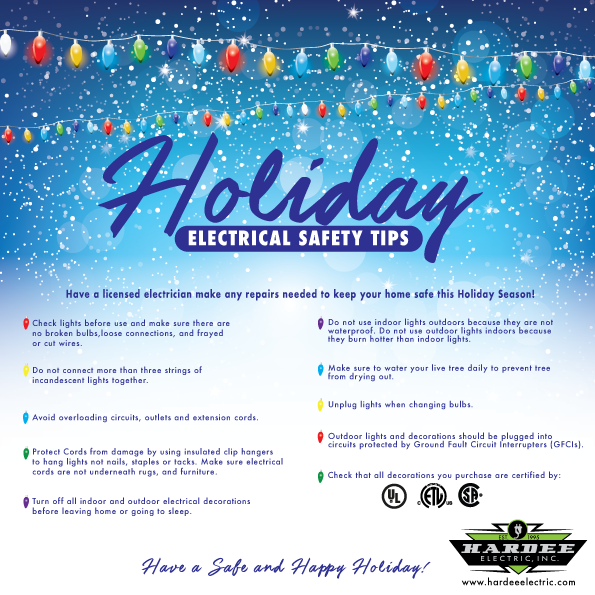 Make sure you have a licensed electrician make any repairs needed to keep your home safe this Holiday Season! Call us at 817-237-6299 to schedule an appointment with one of our technicians.